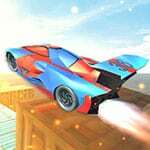 Fly Car Stunt is a game where you operate a toy car on top of a floating structure. Try to get to the finish line without falling down. You can also compete with a friend on the same local computer in 2 player mode. A very long adventure awaits you and your friend on the containers which are hanged on. Your goal is to get to the finish line without dropping. You can open Fly Car Stunt Game in two player game mode and you can struggle against a friend and you can make more exciting races. You can play the game for both 1 player and 2 player. Fly Car Stunt Game is one of our Driving Games at Round Games. It also tagged as a car and 2 player game. To play even more free games, view our most played and all games pages. If you want to play more games like this game: Then you can simply check out the games inside the game tags that are the most relevant to your interests or check the Driving Games category or check the related games section at the end of the game page.